It’s not always easy finding a great sushi place in San Francisco. Often times the quality at inexpensive spots is unacceptable and the high-quality places are just way too expensive. And if you can manage to find an excellent and reasonably priced spot like Domo Sushi, it’ll constantly be plagued by long lines and waits due to its extremely popular Hayes Valley location. That’s why I was so happy to find Live Sushi Bar in the less trafficked Potrero Hill neighborhood. It has consistently proven its ability to hit that sweet spot of freshness, price, value, and ease of access. And I know you’ll love it too. I don’t usually find myself in this part of town, but our recent need to frequently swing by the Potrero Hill UPS for missed packages has given us a reason to be in the area at dinner time often. In fact, the first time we went to Live was right after a UPS stop. As a craving for sushi hit, I pulled up Foursquare to see what was nearby and found Live Sushi Bar rated an impressive 8.7 out of 10 so we drove right over and were happy to find that both parking and seating were plentiful. Jackpot. Even at 8:30 PM when we dropped in that first time, the sushi bar at Live was still going strong. We were excitedly greeted by the entire staff including all three sushi chefs and were immediately seated at the sushi bar. Right off the bat, I noticed that the decor was pretty attractive – casual for sure, but nicer than most places at the price point and certainly nice enough for a low-key date night. 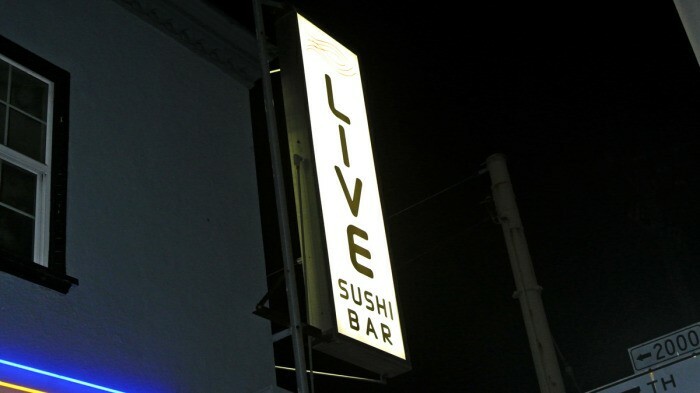 Though the menu at Live includes all sorts of exciting fusion creations unique to the restaurant, we stuck to the traditional sushi options on our first visit. Though I didn’t sample any of those riskier dishes on that first trip, I knew I’d be back to try them at some point. Little did I know how frequently I would actually be returning. Amy began her meal with a Crunchy Tuna Roll which we both found was clean and simple in its presentation and flavor. It involved wrapping spicy tuna, avocado, and crunchy tempura bits in white soybean paper, which was a nice twist on the usual sushi roll appearance. The roll was incredible light feeling, but every bite was big, filling, and had a satisfying crackly crunch. The tuna inside was also particularly spicy – I think the mixture included jalapeño. On some visits, I’ve found the spicy tuna filling too overwhelmingly spicy, but in general I like it a lot. She followed up her Crunchy Tuna Roll with a full plate of Salmon Nigiri which according to her reaction, was absolutely impeccable. She said it was the best salmon sushi she’d every had. I can verify and fully support her salmon findings – my platter included some of that deliciously buttery fresh fish as well. 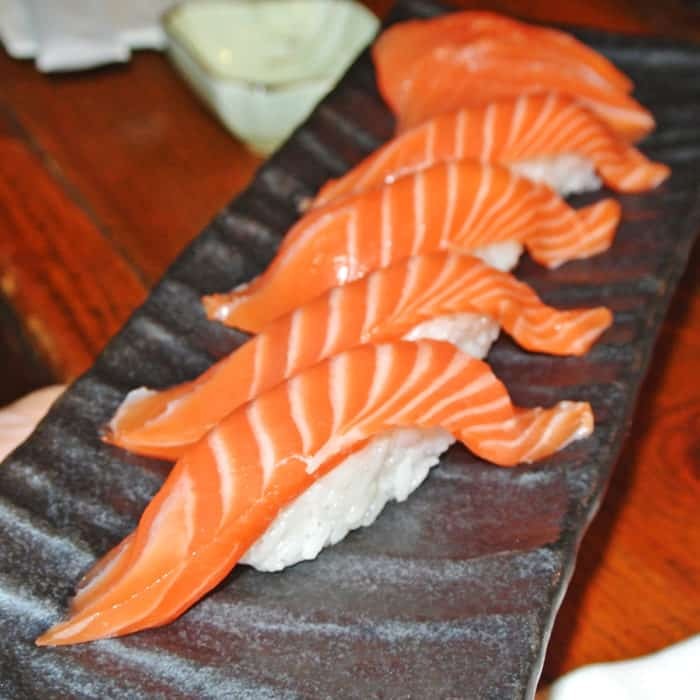 Those salmon nigiri pieces have subsequently become a staple of every single meal we’ve eaten at Live. For my main course that first visit, my attention went straight to the combination section of the menu for The Live Sushi which included 6 pieces of nigiri sushi, 4 pieces of sashimi, and a spicy tuna roll. There was nothing on the plate I didn’t love including the often (elsewhere) haphazardly thrown together spicy tuna roll. 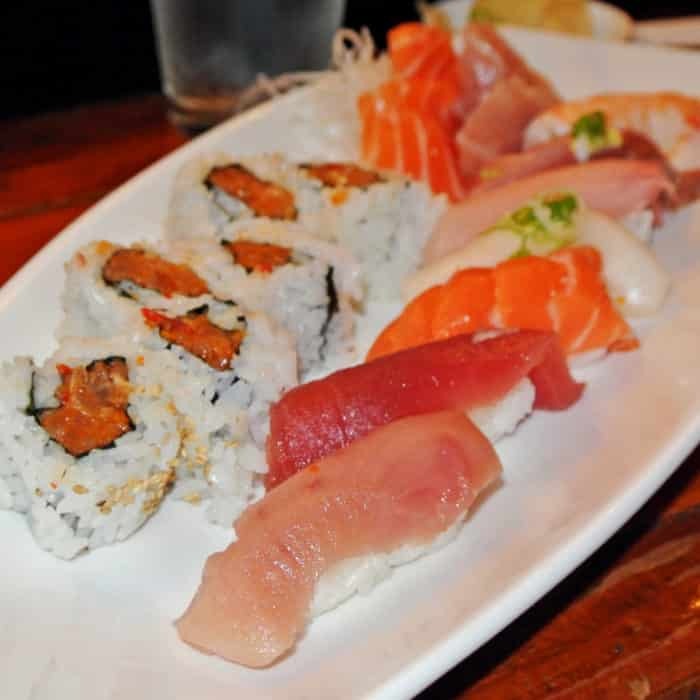 Every piece was fresh, tender, melty, flavorful, and delicious – particularly that salmon sashimi and salmon belly nigiri. On subsequent visits, we’ve tried a variety of other offerings at Live. We started off another trip with a hot appetizer curiously called Nemo. I assume they named it this way because in the dish involved wrapping salmon around large sea scallops in a sort of symbiotic relationship like a clownfish and anemone. Maybe I’m crazy, who knows. 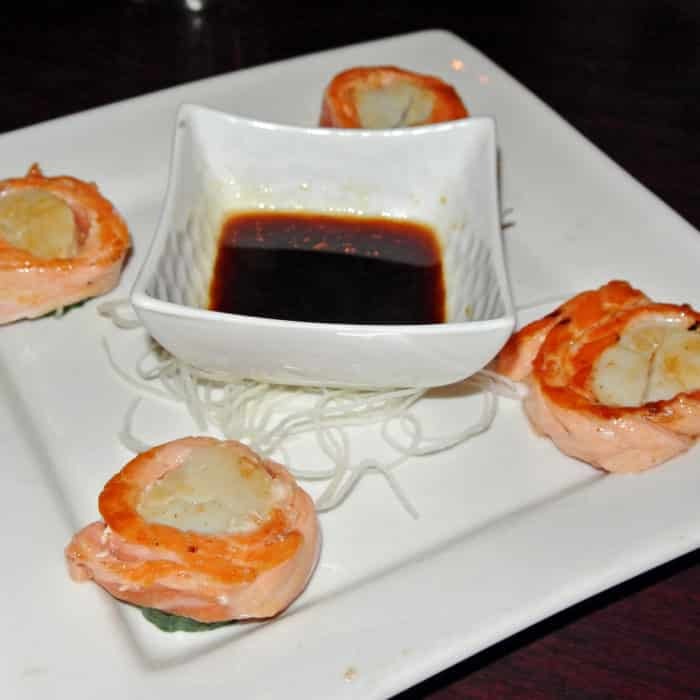 All I can say for sure is that the high-quality salmon and scallops were seared well and were served with a garlic butter dipping sauce that was delicious and paired well. This appetizer tasted mostly of the liquified butter which was interesting and pleasant, but also not necessarily as complex as I would have liked flavorwise. Now, I’ve always been a big fan of seared scallops, but I’ve recently found myself obsessed with raw Japanese preparations of the shellfish – in this case called Hotategai Nigiri. The nigiri pieces were very generously portioned (as they always are at Live) and the mound of rice was nicely doctored with plenty of rice wine vinegar (again, as usual). 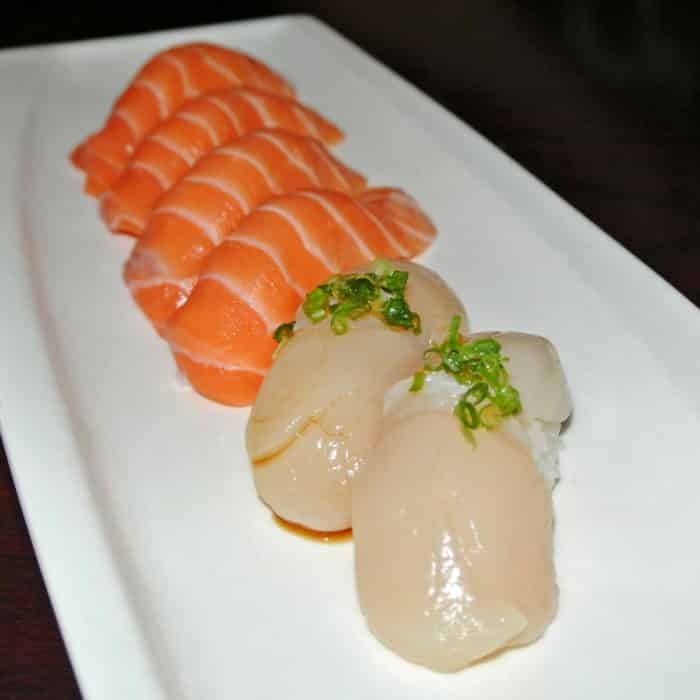 The raw scallops had a wonderful, tender texture and bright ocean-mist flavor that perfectly highlighted the seafood in every excellent nigiri bite. 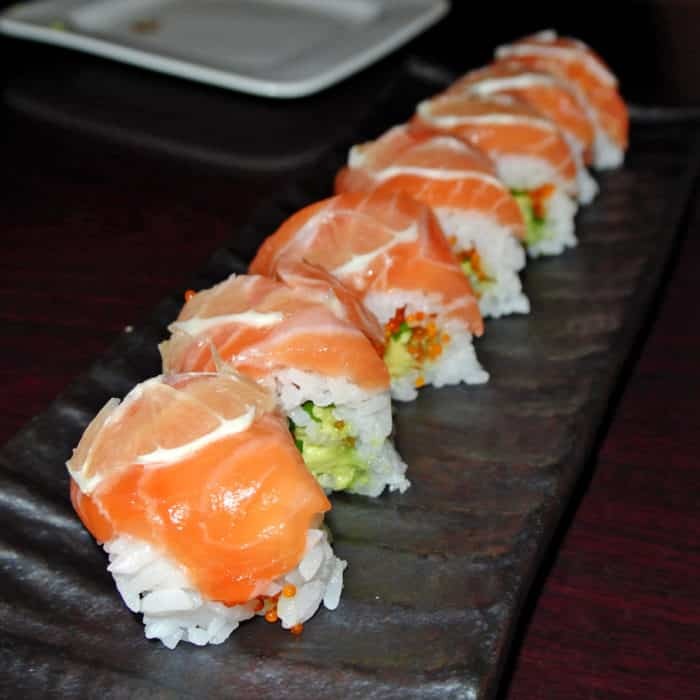 We’ve also sampled a number of the specialty sushi rolls at Live including one you literally can only find in San Francisco and the surrounding Bay Area – the 49er Roll. 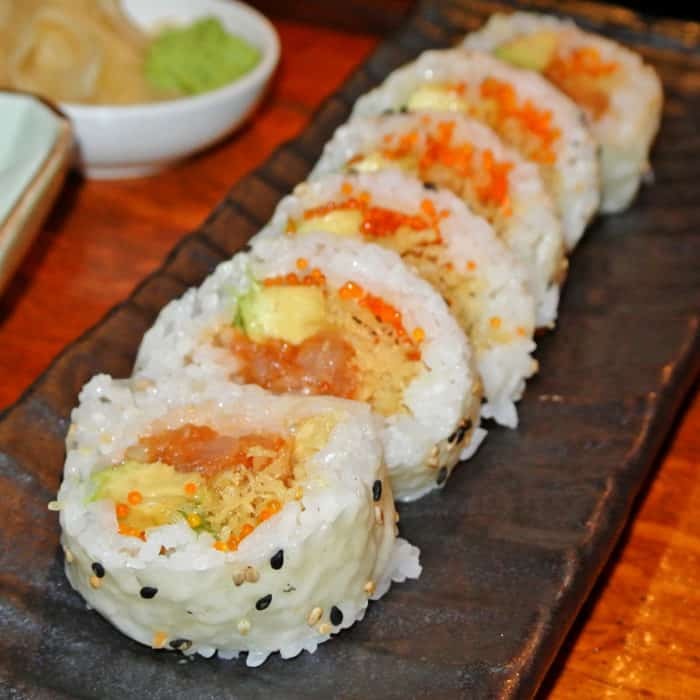 Named after the local professional football team, this roll emulates their colors of – errrr – red and gold with an alternating layering of thin-sliced salmon and lemon. Not exactly a perfect visual parallel if you ask me, but there’s no denying that this flavor combination is downright delicious. Once again, the loosely packed and well-vinegared rice tasted delicious especially with the very fresh buttery salmon and bright citrusy lemon slices serving as flavor contrasts. And as a pleasant twist in the dish, inside the roll, a whole shiso leaf added a nice herbal quality to the overall flavor profile. It was all just really nice. 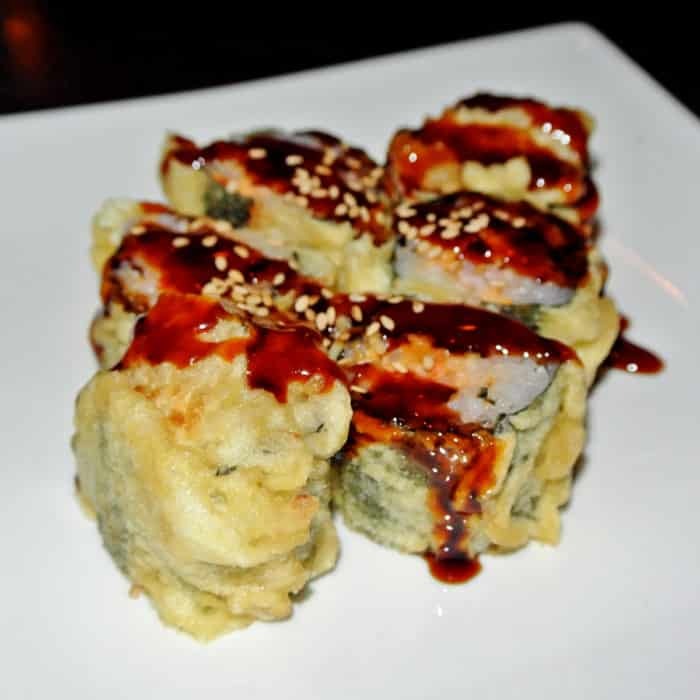 For more ventures into the unusual, we’ve ordered something called a Viper Roll. Basically this is an entire Spicy Tuna Roll that’s been rolled in tempura batter and deep fried. It came out piping hot and nearly burnt our impatient mouths, but it was also quite tasty especially with the heavy drizzle of eel sauce. But really, when isn’t fried food delicious? And finally, one last item worth mentioning – another one of my recent favorites at high-end sushi spots – Amaebi Nigiri. This type of sushi piece involves taking fresh, raw, live, sweet spot-prawns and butchering them to order before laying their bodies over a mound of vinegary rice. 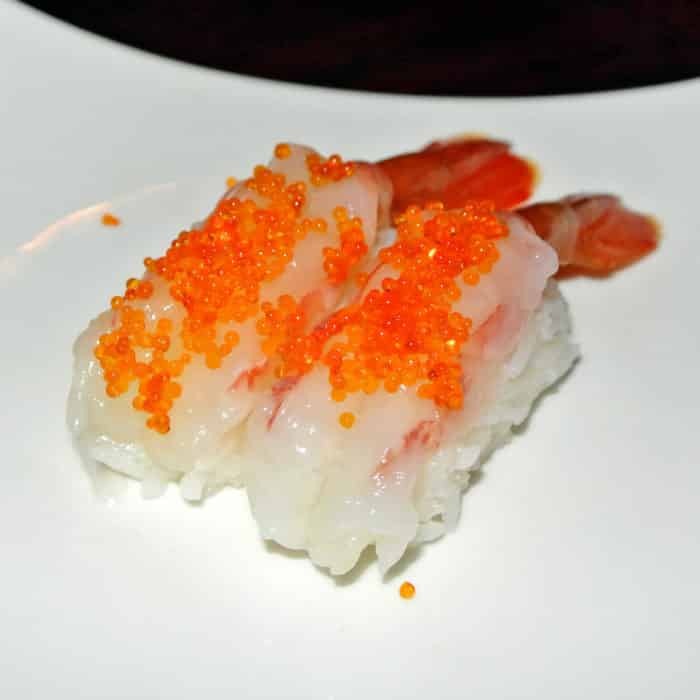 Dressed simply with a sprinkling of orange tobiko, the pieces are designed to highlight the freshness of the raw shrimp. These amaebi pieces were nice, but I’ve definitely had more flavorful amaebi elsewhere. But there is another reason I frequently order amaebi – the other half of the eating experience. Like I said, amaebi nigiri involves beheading live prawns and eating their bodies raw. 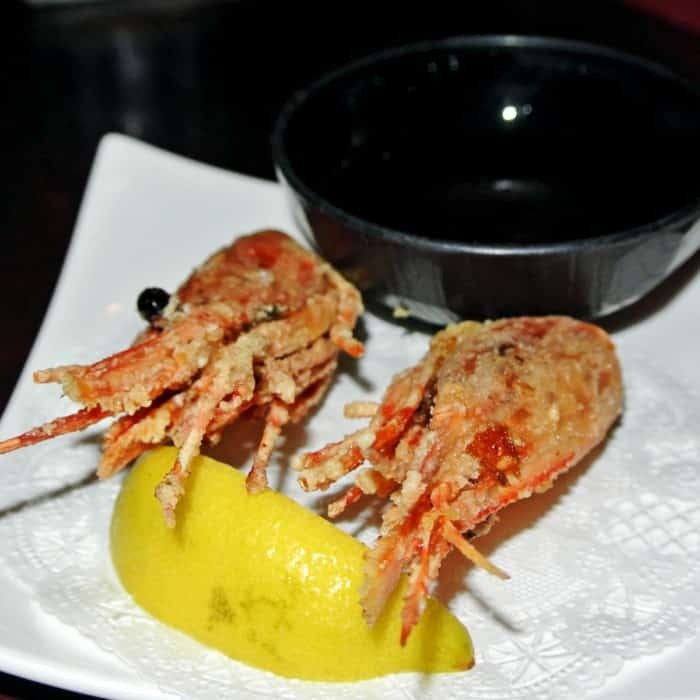 So with a Japanese waste-nothing ethos, sushi bars often throw these super crispy, crunchy whole prawn heads into the deep fryer and serve them along with a dipping sauce as a follow up to the two pieces of nigiri. These bites can be a little disconcerting for less adventurous eaters and also can be a little greasy from the deep frying process, but I love those crispy fried extraterrestrial bonus bites. So as you can see, I’m pretty excited about this off-the-beaten-path sushi find. 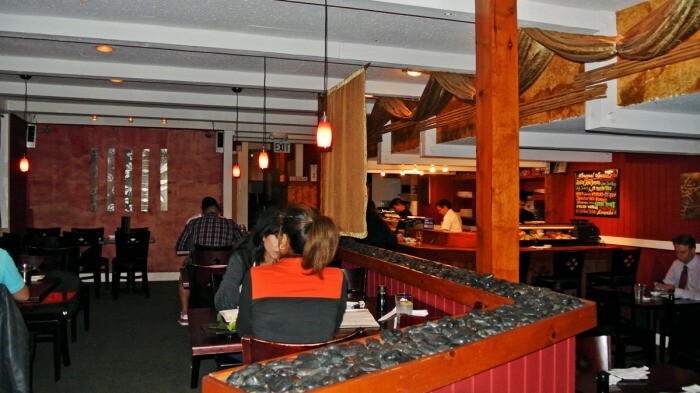 The quality at Live Sushi Bar has been consistently great and the prices are very reasonable. Sure there are a few rather expensive items on the menu, but if you order smart you can get out of there with some excellent raw fish in your belly and plenty of cash still in your wallet. Got another great, reasonably priced sushi spot in SF I need to check out? Let me know in the comments below.